Try our rich chocolate tart with a hint of cardamom and cinnamon and you'll be smitten. It's the perfect finale to a romantic supper or a weekend indulgence with friends. Divine. 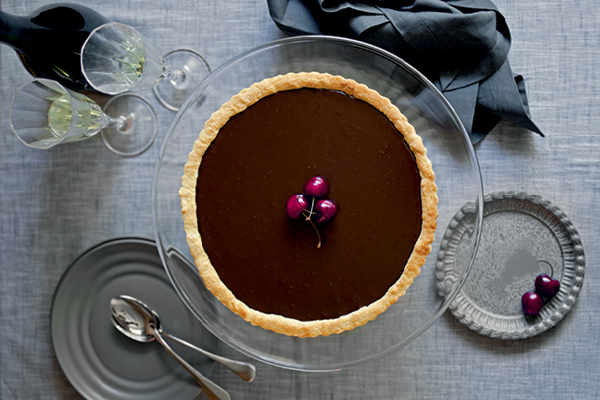 Few desserts make a dinner guest’s eyes light up like a rich chocolate tart. Serve in lavish quantities. RICH CHOCOLATE TART Cloves, cardamom and cinnamon make for a grown-up take on a gooey pud. 2. Take a small saucepan, add the double cream and spices and place over a medium heat. 3. Bring to the boil and then immediately remove and set aside. Leave for about 30 mins. 4. Place chopped chocolate in a mixing bowl and set aside. 5. Place saucepan back on the heat and bring to the boil. Remove immediately and then pour over the chopped chocolate. Stir until the mixture is lovely and glossy. 6. Pour the chocolate mix into the prepared pastry case. Transfer to the fridge and leave to set for approximately 2 hours. 7. Serve tart at room temperature topped with the whole cherries. Find the recipes for a complete Valentine's Day Supper including Mushroom Soup, Herbed Buttered Oysters and Pomegranate Mignonette Oysters in issue 20 of The Simple Things.